When your washing machine is broken and the laundromat is too far away, the first thing that probably comes to mind is dumping all your dirty clothes in the tub and laboriously scrubbing with your hands. I'm too lazy to do that, but I'm not willing to go out in grimy clothes. Denim jeans can survive a fairly long time without being washed, and you can kill off all the smelly bacteria just by freezing them, but what about other types of clothes? 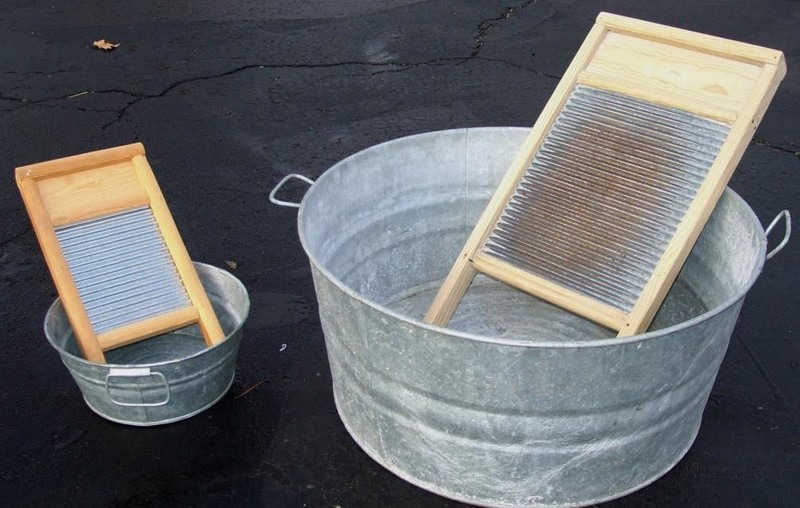 You could invest in some seriously old-school washboards like the ones below, but it's not much easier than the hands-only approach, and it could ruin certain types of fabric. Actually, back when it was invented, there wasn't anything "hillbilly" about this hand-operated washing machine. It was easier to use than a washboard, and before the time of electric washing machines. 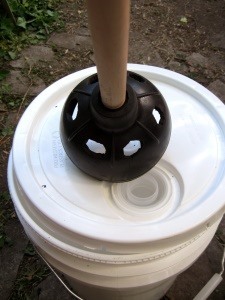 It may look like a toilet plunger, but this agitator is commonly referred to as a "rapid laundry washer" or "breathing mobile washer," and is made of either tin or rubber. 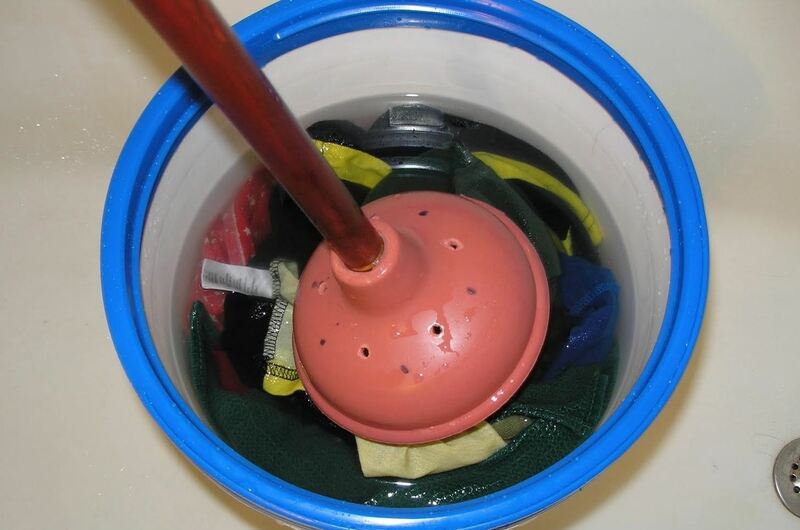 The internal baffle in the plunger sends water rushing through the clothes to flush out the dirt. It's actually a pretty common item in third-world countries where power is scarce or too expensive, as well as in camping situations. Word is it actually makes your clothes cleaner than an electric front-loader, and it's obviously a lot more eco-friendly than your Whirlpool. It also has the added benefit of being gentle enough for your "hand wash only" clothes. 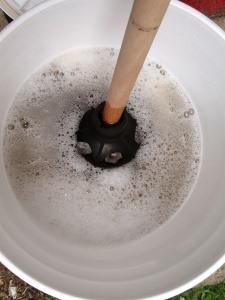 Just grab a five-gallon bucket with a lid and a toilet plunger and you've got a easy-to-operate makeshift washing machine that's less work for you and safe on your clothes. 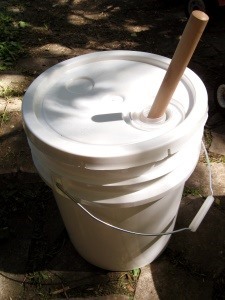 If you're lucky like Melissa Dimock of Refashionista, you'll be able to find a five-gallon bucket with a hole in the top already, but if not, making one is as easy as gouging one out in the lid of whatever bucket you have. 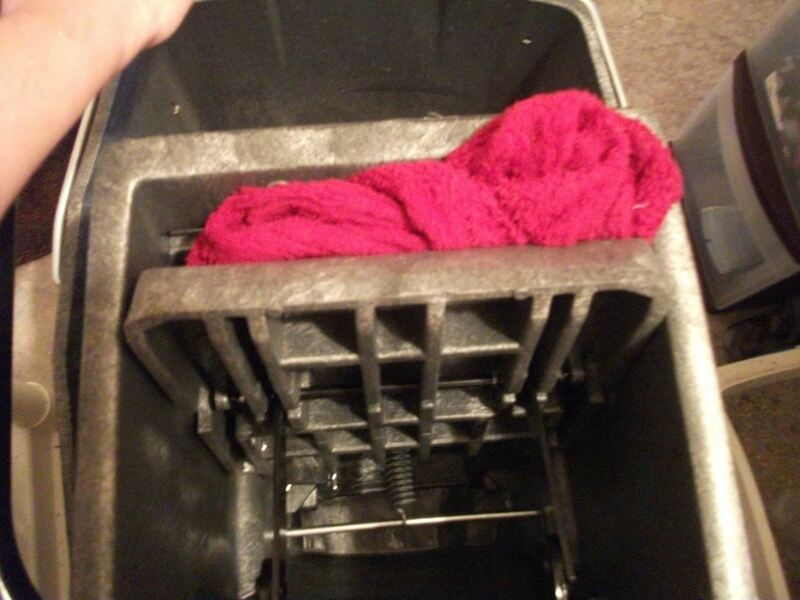 The hold just has to be big enough for the plunger handle to move freely in. Melissa opted to cut a couple holes in the rubber of the plunger to help decrease the amount of suds created from all of the suction. You could also make your holes smaller if you'd like. All depends on your preference. If you're out camping with this, powdered detergerent in a ziplock bag is the best way to go, but if you're at home using this sucker, it's best to use liquid detergent because it's too easy to get powder ingrained in your clothes. 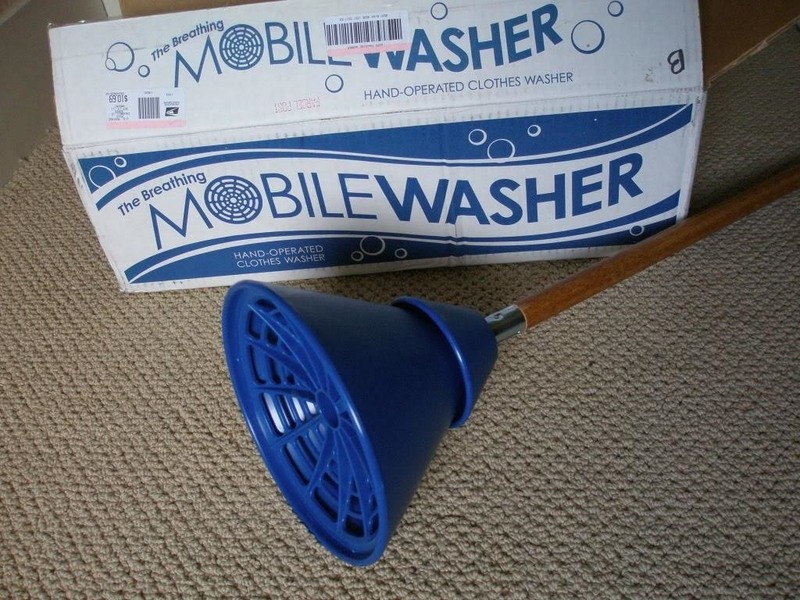 There's no spin cycle, so your going to have to hand rinse them as best as you can. 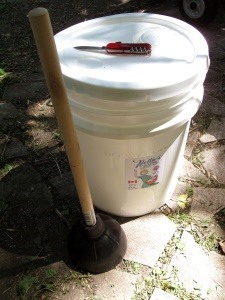 Or, you can invest in a mop bucket with a hand-wringer to squeeze out all of the water in your clothes like Daisy Luther of The Organic Pepper does. If you have any hardwood floors, it might be a wise investment anyway. Once all the water is wrung out, just hang out on the line to dry.